Hope Studios: Tutorial Tuesday with My 2 Sugarplums! Tutorial Tuesday with My 2 Sugarplums! Now, let's meet one of my newest sponsors, Melinda, from My 2 Sugarplums! Melinda became a lover of fabric arts when she was introduced to quilting years ago and was really inspired to try some things she saw on blogs after the birth of her daughter. This lady has fallen in love with this particular type of fabric art and spends every free minute that she isn't working her full time job, with her sewing machine! Melinda's Etsy shop features fun, affordable sewn pieces that are cute as a button! Looking at all the sweet holiday shirts and onsies she creates makes me want another little one around here! And what about these Mitten and Penguin shirts? 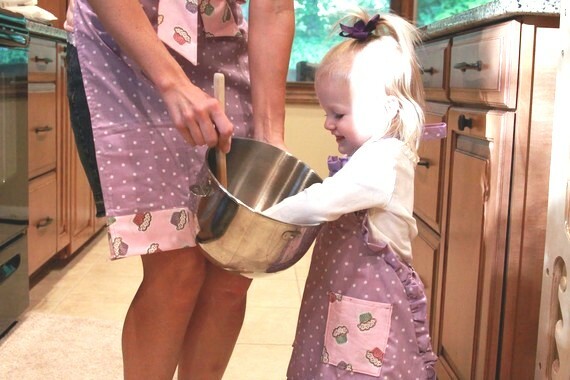 I have to take a minute to show you this Matching Apron Set before I go on...I'm smitten! Melinda is offering 10% off your purchase for Hope Studios readers! Just enter the code word "Hope" in the message to seller box during checkout. She also has a $25 gift certificate to spend at My 2 Sugarplums? for one lucky winner this week! Want to win? Visit My 2 Sugarplums then comment below to tell me what item you would choose with your gift certificate. The birthday hat shirt is so cute. So are the matching aprons. Thanks for hosting again. I love your fun blog. I added your blog button to my Challenge page on my blog. Wowza!!! More great stuff to make and create!!! Tuesdays are great! I love the matching aprons, but I also love the reindeer shirt with the bow. Would LOVE to win her "Matching Mitten Shirt and Ruffle Pants." Too cute!!!! !